EASTON, PA--(Marketwired - October 05, 2015) - 523 years after two members of his crew discovered the first handrolled cigars, Columbus is back in tobacco again. 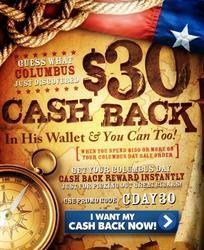 Famous Smoke Shop, a leading online distributor of discounted premium cigars, specializing in offering the web's widest selection of cigars at the lowest prices, is offering cigar smokers $30 instant cash back during their Columbus Day Sale, which runs from October 5 through October 12, 2015. The offer applies to orders of $150.00 or more (U.S.), and is redeemable during checkout on their website, Famous-smoke.com, by entering the promo code, CDAY30. For their brick & mortar customers, the instant cash-back reward is also being offered at Famous Smoke Shop's retail store, which is located at 90 Mort Drive, Easton, PA 18040. The promotion will be supported via a nationwide email campaign, as well as across social media channels like Facebook, twitter, and Instagram, among others. "Customer response to cash-back offers we've done for past sales has been very high," said Famous Smoke Shop Senior Marketing Director, John Lamberti. "Tying it to a national holiday like Columbus Day almost always results in attracting new customers and a big increase in website traffic, too." In addition to the leading cigar brands Famous will be featuring during the sale, customers can also use their cash-back reward for orders that include cigar humidors and accessories. "This is usually the time of year when cigar smokers like to stock-up for winter," added Mr. Lamberti. "We also tend to see an increase in humidor sales, especially among customers who live in the colder parts of the country." Even though he's responsible for introducing smoking tobacco to the world, most consumers don't associate Columbus's discovery of the Americas with cigars. But this Columbus Day, Famous Smoke Shop's $30 cash-back reward will be a welcome discovery for cigar smokers looking for the best cigar deals online. "It may be obvious," said Mr. Lamberti, "but everybody loves getting cash back, especially when they don't have to wait for it." Famous Smoke Shop is the nation's #1 discount retailer of premium cigars online, offering one of the largest selections of handmade cigars, machine-made cigars, cigar humidors, and accessories. Famous offers the web's lowest prices on a wide selection of cigar brands including Acid, Davidoff, Macanudo, Romeo y Julieta, Ashton, Padron, Oliva and Perdomo cigars, and many more. Famous offers their customers the best prices on all premium cigars as well as friendly and knowledgeable customer service.